The option to purchase an SSL renewal becomes available 30 days before its expiration. Renewal notifications are sent to the account email address 30, 15, 7 and 1 day prior to expiration date. You can add renewal for your SSL to your cart right from one of the renewal emails or from your Namecheap account. Click “Renew now” from email, you’ll be redirected to cart. Once you complete the purchase, activate SSL and install it. 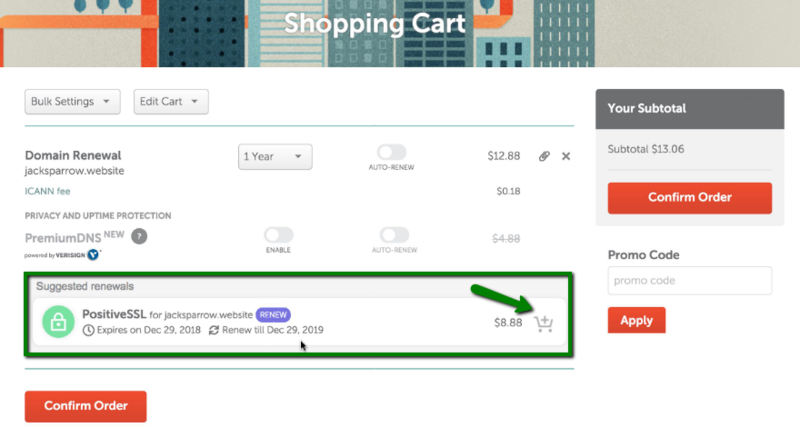 Navigate to 'Expiring/Expired' > 'Products' tab in your Namecheap account. Then click the cart icon next to the certificate you want to renew. You will be redirected to cart. Since January 2019, it is possible to renew SSL certificate during domain renewal earlier than 30 days before the SSL expiration if both services are purchased with Namecheap. For this, make sure you add the renewal certificate to the Shopping Cart along with the domain renewal. The certificate associated with this domain name will be given as a suggested item to renew. The certificate purchased this way will actually renew the existing one within up to 15 months before its expiration date. As usual, all the remaining days of the existing certificate will be added to the renewal one. Once the SSL renewal item is added to the order and purchased along with renewal domain, please proceed with the below steps getting it activated and installed. Generate a new CSR code from your hosting control panel code from your hosting control panel or contact your hosting provider for assistance. Go to the Domain List section. Choose the ‘All Products’ filter option. 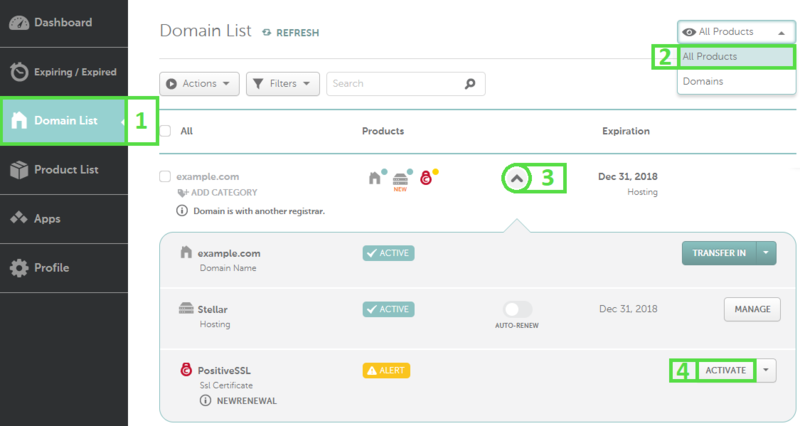 Type in the domain linked to the SSL certificate renewal into the search area. You will get to the same activation flow as for the expiring SSL. If you’re renewing an OV or EV, certificate authority may request company re-validation, which requires paperwork. To speed up OV/EV issuance, please make sure that legal company info you submit during activation is identical to public listings (DnB, Bloomberg, qualified governmental information sources). To install your updated SSL certificate please refer to SSL installation guide or contact your hosting provider for assistance.